The Santa Bárbara Mission Archive – Library is pleased to host this free lecture and viewing of Edwin Deakin’s oil paintings of the 21 Missions of Alta California. The Santa Bárbara Mission Archive-Library is pleased to host this free lecture and viewing of Edwin Deakin’s oil paintings of the 21 Missions of Alta California. Mr. Haskins will share his efforts restoring several Mission paintings by Henry Chapman Ford for the Mission Inn in Riverside and the Mission paintings by Edwin Deakin for the Santa Bárbara Mission Archive-Library. A tour of the 21 oil paintings of California Mission paintings by Edwin Deakin in SBMAL’s collection and reception will follow. This is a rare collection that was a gift from Howard Willoughby in the 1950s and is one of two complete sets in oil painted by Deakin in the late 1890s. The conservation of the Deakin paintings is an ongoing project and guests will be given the opportunity to see the progress of the restorations work begun thanks to a leadership gift provided by our friends Marc and Pauline Sylvain. Scott M. Haskins has been a painting conservator since 1975. His company, Fine Art Conservation Laboratories (FACL, Inc.) has been responsible for the restoration of many significant paintings from early California. The Santa Bárbara Mission Archive-Library is a not-for-profit 501(c)(3) educational and historical research institution and is home to a unique collection of sources related to the missions of California, California history, Franciscan history, and the history of native peoples in the Southwest. 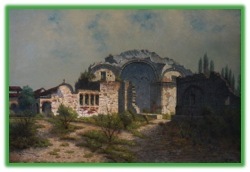 The painting is of the Mission in San Juan Capistrano: From the collection of the Santa Bárbara Mission Archive-Library. Cannot be duplicated or distributed without prior authorization. For more information about how you can support the Deakin painting conservation project, please contact Monica Orozco by email at director@sbmal.org or by phone at (805) 682-4713 ext. 152. I love the missions of CA. Our father used to take us on summer trips and we’d stop off at them. Such great memories. Such an important part of history. Such great work you are doing.